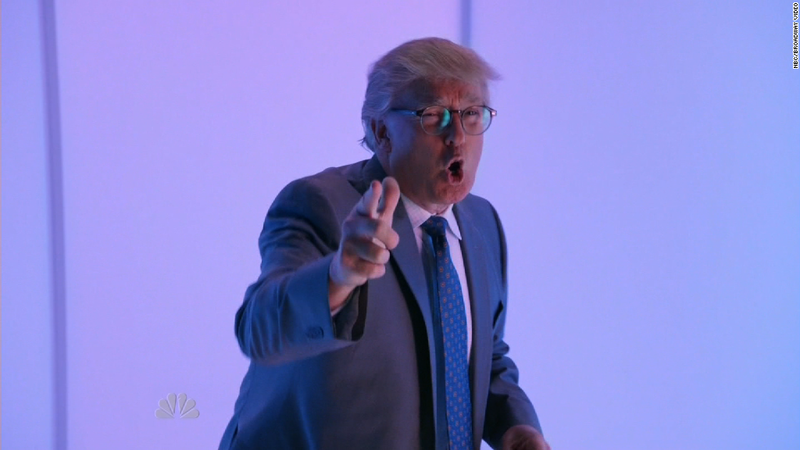 Donald Trump as host of "Saturday Night Live" brought in ratings for NBC that Trump himself would call "huge." The presidential candidate on "SNL" brought in an overnight rating of 6.6, the biggest overnight rating for the long-time variety show since 2012. Saturday's number is up roughly 50% from the season premiere on October 3 that included an appearance from Hillary Clinton, and had been the highest of the season at 4.5. While the TV ratings for Trump on "SNL" were big, the reaction to Trump's performance was lukewarm with some critics saying that Trump didn't live up to the hype. "The fevered lead-up to Donald Trump's 'Saturday Night Live' episode turned out to be more exciting than the edition of the show he hosted," wrote Variety TV columnist, Maureen Ryan. "Most of the sketches involving Trump were weak, timid or predictable." This was also the general consensus of those watching at home on social media with many tweeting out that Trump on "SNL" was an easygoing affair. "Surprisingly mild + light-hearted SNL considering buildup," tweeted CNN contributor and former TV reporter Bill Carter. "No fireworks; only glancing satire directed at or from [Donald Trump]." One of the brighter moments of the show was when Trump was heckled by Larry David, who called out, "Donald Trump is a racist." David said on the show that he was told he would get $5,000 from a group for saying it. DeportRacism.com made the offer to protest Trump's comments in August that many Mexican immigrants are criminals and rapists. The group said it would pay the $5,000 "bounty" to David. Other outlets, like The Hollywood Reporter, were a bit more harsh in appraising Trump's performance, saying that the candidate's gig was "toothless" and "uncomfortable." "Having a politician in the midst of an active presidential campaign was always a dismal idea for 'Saturday Night Live,' particularly a candidate with as much negative baggage as Donald Trump," wrote The Hollywood Reporter's TV critic Daniel Fienberg. "But even with expectations lowered to bargain-basement level, this week's show was a dumpster fire." Regardless of the reviews, Trump seemingly had a good time hosting. "@nbcsnl - So much fun last night!" he tweeted on Sunday morning.
.@nbcsnl - So much fun last night!